During the 1980s, French aerospace company Aérospatiale and Italian aviation conglomerate Aeritalia merged their separate work upon a new generation of regional aircraft together. For this purpose, a new jointly owned company was established, ATR, for the purpose of developing, manufacturing, and marketing their first airliner, which was later designated as the ATR 42. On 16 August 1984, the first model of the series, designated as the ATR 42–300, performed the type's maiden flight. Type certification from French and Italian aviation authorities was granted during September 1985, and the aircraft performed its first revenue-earning flight, operated by launch customer Air Littoral, during December of that year. To date, all of the ATR series have been manufactured at the company's final assembly line in Toulouse, France; ATR benefits from its sharing of resources and technology with Airbus SE, which has continued to hold a 50 percent stake in the company. Improved models of the aircraft have been introduced, incorporating new avionics such as a glass cockpit, and the adoption of newer engine versions for enhanced performance, such as increased efficiency and reliability along with reductions in operational costs. The aircraft serves as the basis for the larger ATR 72, which was also developed during the late 1980s to complement its smaller sibling. The ATR 42 and ATR 72 have been produced side-by-side for decades. First flight in Toulouse-Blagnac Airport, 16 August 1984. During the 1960s and 1970s, European aircraft manufacturers had, for the most part, undergone considerable corporate restructuring, including mergers and consolidations, as well as moved towards collaborative multi-national programmes, such as the newly launched Airbus A300. In line with this trend towards intra-European cooperation, French aerospace company Aérospatiale and Italian aviation conglomerate Aeritalia commenced discussions on the topic of working together to develop an all-new regional airliner. Prior to this, both companies had been independently conducting studies for their own aircraft concepts, the AS 35 design in the case of Aerospatiale and the AIT 230 for Aeritalia, to conform with demand within this sector of the market as early as 1978. On 4 November 1981, a formal Cooperation Agreement was signed by Aeritalia chairman Renato Bonifacio and Aerospatiale chairman Jacques Mitterrand in Paris, France. This agreement signaled not only the merger of their efforts but of their separate concept designs together into a single complete aircraft design for the purpose of pursuing its development and manufacture as a collaborative joint venture. This agreement served not only as the basis and origins of the ATR company, but also as the effective launch point of what would become the fledgling firm's first aircraft, which was designated as the ATR 42. By 1983, ATR's customer services division has been set up, readying infrastructure worldwide to provide support for ATR's upcoming aircraft to any customer regardless of location. On 16 August 1984, the first model of the type, known as the ATR 42–200, conducted its maiden flight from Toulouse Airport, France. During September 1985, both the French Directorate General for Civil Aviation (DGCA) and the Italian Italian Civil Aviation Authority awarded type certification for the type, clearing it to commence operational service. On 3 December 1985, the first production aircraft, designated as the ATR 42-300, was delivered to French launch customer Air Littoral; the first revenue service was performed later that same month. During January 1986, already confident of the ATR 42's success and of the demand for an enlarged version of the aircraft, ATR announced that the launch of a programme to develop such an aircraft, which was designated as the ATR 72 to reflect its increased passenger capacity. By the end of 1986, the ATR 42 had accumulated a sizable backlog of orders, which in turn led to a ramping up of the type's rate of production. During August 1988, ATR's marketing efforts in the lucrative North American market resulted in the securing of a large order of 50 ATR-300s from US operator Texas Air Corporation; that same year, another American regional carrier, Trans World Express, received the 100th production aircraft. On 1 July 1989, ATR opened their new global training centre for the type in Toulouse, which provided centralised and modern facilities for the training to airline staff and other personnel across the world. During June 1999, the ATR global training center became one of the first European institutions to be recognised as a Type Rating Training Organization (TRTO), as defined by the Joint Aviation Authorities (JAA). During September 1989, it was announced that ATR had achieved its original target of 400 sales of the ATR. That same year, deliveries of the enlarged ATR 72 commenced; shortly thereafter, it became common for both types to be ordered together. Since the smaller ATR 42 is assembled on the same production line as the ATR 72, along with sharing the majority of subsystems, components, and manufacturing techniques, the two types support each other to remain in production. This factor may have been crucial as, by 2015, the ATR 42 was the only 50-seat regional aircraft that was still being manufactured. In order to maintain a technological edge on the highly competitive market for regional airliners during the 1990s, several modifications and improved versions of the ATR 42 were progressively introduced. The initial ATR 42-300 model remained in production until 1996, while the first upgraded (and broadly similar) model, designated as the ATR 42-320, was also produced until 1996. The -320 variant principally differed in that it was powered by a pair of the more-powerful PW121 engines, giving it improved performance over the 300. Another variant, the ATR 42-300QC, was a dedicated 'quick-change' (convertible) freight/passenger version of the standard −300 series. The next major production version was the ATR 42−500 series, the development of which having been originally announced on 14 June 1993. Performing its maiden flight on 16 September 1994, and awarded certification by the British Civil Aviation Authority and France's (DGCA) during July 1995; the -500 model was an upgraded aircraft, equipped with new PW127 engines, new six-bladed propellers, improved hot and high performance, increased weight capacity and an improved passenger cabin. 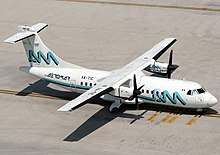 On 31 October 1995, the first ATR 42-500 was delivered to Italian operator Air Dolomiti; on 19 January 1996, the first revenue service to be performed by the type was conducted. In addition to new aircraft models, various organisational changes were also implemented. On 10 July 1998, ATR launched its new Asset Management Department. On June 2001, EADS and Alenia Aeronautica, ATR's parent companies, decided to reinforce their partnership, regrouping all industrial activities related to regional airliners underneath the ATR consortium. On 3 October 2003, ATR became one of the first aircraft manufacturers to be certified under ISO 9001-2000 and EN/AS/JISQ 9100, the worldwide quality standard for the aeronautics industry. During July 2004, ATR and Brazilian aircraft manufacturer Embraer announced a cooperation agreement on the AEROChain Portal for the purpose of delivering improved customer service. During April 2009, ATR announces the launch of its 'Door-2-Door' service as a new option in its comprehensive customer services range. The current production version is the ATR 42-600 series. On 2 October 2007, ATR CEO Stéphane Mayer announced the launch of the −600 series aircraft; the ATR 42–600 and ATR 72–600 featured various improvements to increase efficiency, dispatch reliability, lower fuel burn and operating costs. While broadly similar to the earlier -500 model; differences include the adoption of improved PW127M engines, a new glass cockpit, and a variety of other minor improvements. Using the test registration F-WWLY, the prototype ATR 42–600 first flew on 4 March 2010. The first aircraft was delivered to Tanzanian airline Precision Air in November 2012. As a consequence of strong demand for the -600 series, ATR decided to invest in the establishment of a second, more modern final assembly line and acquisition of more hangar space at their Toulouse site, along with a new large completion and delivery area; overall, the manufacturing operation expanded to four times the footprint that it had in 2005. Speaking in October 2015, ATR CEO Patrick de Castelbajac stated that the firm was set to produce in excess of 90 aircraft that year, and that the new manufacturing facilities could support a production rate of up to 120 per year. At the time, the company had a backlog of orders for 300 aircraft, sufficient for three years’ of production. During 2017, a new in-house financing and leasing division was established by ATR in order to offer customers a greater degree of support and expand the company's range of services. Considerable emphasis has been placed upon the continuous development of ATR's aircraft models. Additionally, during the mid-2010s, reports emerged that the development of a further stretched 90-seat ATR model was under consideration as well; allegedly, shareholder Airbus was relatively unenthusiastic on proceeding with such a development, while ATR CEO Fabrice Brégier favoured a focus on resolving manufacturing issues. During the late-2010s, ATR conducted a feasibility study into developing the ATR 42's short takeoff and landing capabilities, potentially enabling the type to make using of runways as short as 800 meters (2,625 feet) via the adoption of enhanced brakes and a drastically modified tail unit; the company viewed this measure as expanding the aircraft's potential and opening new sales possibilities. It could introduce a steep approach capability and operating costs that compare to 30-seaters. STOL improvements should be launched in 2019 to reduce landing distance from 1,100 to 800 m (3,600 to 2,600 ft). Existing control surfaces would be reengineered with takeoff flaps extended to 25°, and both spoilers deploying at landing and not only for inflight turns, adding an autobrake system, while the rudder’s tab and upper section is modified to increase its maximum deflection to counter an engine failure, lowering the minimum control speed. ATR estimates a market for STOL 20–42 seaters of 800 over 30 years, to serve islands and deliver cargo to short runways. The ATR 42-600S empty weight will be reduced with lighter seats and galley fittings an orders could be announced at the June 2019 Paris Air Show for a first delivery 2–3 years after. On 21 August 1990, US airline American Eagle placed a large order for 100 ATRs, composed of 41 ATR 42s and 59 ATR 72s, further consolidating ATR's position in North America. On 5 September 1997, American Eagle took delivery of the 500th ATR to be built. On 5 June 1998, Tarom, the national carrier of Romania, accepted delivery of its first two ATR 42-500, of a batch of seven aircraft ordered a year earlier. On 28 June 1998, ATR gains foothold in the Cuban market following an order from airline Cubana de Aviacion for the ATR 42. During 2000, the combined global ATR fleet attained its 10,000,000th flight, during which a cumulative distance of approximately 4 billion kilometres (2.5 billion statute miles) had been traversed and around 450 million passengers had flown onboard ATR-built aircraft. 2007 set a new record for the programme's sales, a total of 113 new ATR aircraft having been ordered during a single year. 2011 was another record-breaking year for sales at ATR. According to ATR's CEO Filippo Bagnato, sales had continued to grow during the Great Recession despite the downturn experienced by most aviation companies as "fuel consumption that can be half that of the alternatives and [with] lower maintenance costs". Bagnato noted the strength of Africa as a market for the type, as well at the firm's aircraft being capable of serve destinations that would otherwise be inaccessible with other aircraft due to the austere conditions of many airstrips and runways in the region, as well as the ability to operate autonomously without any reliance upon ground support equipment. For 2013, ATR claimed a 48 per cent global market share for regional aircraft deliveries between 50 and 90 seats (comprising both turboprops and jets), making it the dominant manufacturer within this sector of the market. That same year, during which firm orders for 10 ATR 42-600s and 79 ATR 72-600s were recorded, leasing companies were responsible for 70 per cent of these; according to ATR's CEO Filippo Bagnato: "Years ago, we were not even considered by the lessors; now they see ATRs as a good investment". During May 1997, ATR had achieved its first breakthrough sale in China, placed by operator China Xinjiang Airlines and the CAAC. By 2013, while the Asia Pacific region had comprised the majority of ATR's sales when geographically ranked; however, orders from Chinese airlines remained elusive; Bagnato ascribed this anomaly to local market conditions dictating the typical use of larger aircraft, as well as a Chinese government policy of imposing high tariffs on the import of foreign-built fixed-wing aircraft. During late 2014, ATR set up a new office in Beijing and hired several former Airbus sales personnel with the aim of launching the type on the Chinese market. ATR believed that many of the already-flown routes did not suit larger 150-seat aircraft; however, of the roughly 2,600 commercial aircraft flying in China at that time, only 68 had a capacity of less than 90 seats and of these, fewer than 20 aircraft were powered by turboprop engines. In response to airlines often wanting to phase out their early production ATR models to replace them with the latest generation ATR series, as well as to answer demand from cargo operators for the type, ATR has operated two separate dedicated freighter conversion programmes, known as the Bulk Freighter (tube version) and the ULD Freighter. Both conversions involve complete stripping of furnishings along with the addition of floor strengthening, new window plugs and 9g restraining nets, six additional longitudinal tracks for added flexibility, and an E-Class cabin; the ULD model can accommodate standard ULD-packaged cargo, such as LD3 containers or 88x108in (2.2x2.7m) pallets, which were loaded via a large cargo door located on the port forward side. Undertaken by a range of companies, such as Alenia subsidiary Aeronavali, Texas-based M7 Aerospace; French firms Indraéro Siren and Aeroconseil, Canadian Infinion Certification Engineering, and Spanish company Arrodisa, by October 2012, in excess of one-fifth of all first-generation ATR 42 and ATR 72 aircraft had already been converted to freighters. During January 2017, Japanese regional airliner Japan Air Commuter (JAC) has taken delivery of its first ATR 42-600, becoming the first owner-operator of the type in the nation. The aircraft was one of nine to have been ordered by JAC, along with options for a further 14 ATR 42s, as a replacement for its aging Saab 340 fleet; reportedly, the airline is considering replacing its Bombardier Q400s with ATRs as well. Early -200/-300/-320 have four-blade propellers. Later -400/-500/-600 have propellers with six blades. The −200 was the original ATR 42 prototype and only a few were built for testing purposes. It was powered by Pratt & Whitney Canada PW120 engines rated at 1,800 shp (1,300 kW). The −300 was the standard production version. This model was manufactured until 1996. It was powered by Pratt & Whitney Canada PW120 engines rated at 2,000 shp (1,500 kW). The −320 was an improved version of the −300 powered by PW121 engines (2100 shp). It was designed to have better performance especially in hot and high conditions. The ATR 42−400 is an upgraded version of the −320 using six-bladed propellers on otherwise identical PW121 engines. Three ATR 42−400 were delivered to the Government of Italy as the ATR 42 "Surveyor" version. 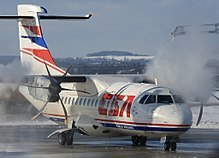 The only two civilian ATR 42-400 produced (msn 487 & 491) were delivered to CSA Czech Airlines in 1995/1996 as an interim upgrade prior to delivery of -500s. In 2006 these two aircraft were sold to Conviasa. The ATR 42-500 is a further upgraded version, the first delivery of which occurring during October 1995. It has many improvements for performance and passenger comfort including new engines, new propellers, a newly designed cabin, and increased weight. It has six-bladed propellers powered by PW127E engines rated at 2,400 shp (1,800 kW) for improved hot and high performance and increased cruise speed. The engines are flat rated for +45C. Propellers are electrically controlled and are made from composite. It has an increased maximum takeoff weight, allowing for more cargo and greater range. Due to the six-bladed propellers and better insulation, it has reduced noise levels. The newest version have CATII capability and dual Honeywell HT1000 FMS installation. 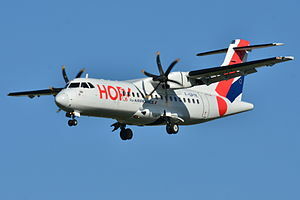 During October 2007, the launch of the ATR 42−600 series was announced. Akin to the ATR 72–600, the –600 series featured the PW127M as its standard engine (providing 5% additional thrust, thus improving performance on short runways, in hot weather and on high altitude; the "boost function" activates the additional power as needed. It also features a Glass Cockpit flight deck, complete with five wide LCD screens, that replaced the previous EFIS (Electronic Flight Instrument System); additionally, a Multi-Purpose Computer (MPC) enhances flight safety and operational capabilities. Avionics supplied by Thales provides CAT III and RNP capabilities. It also includes lighter, more comfortable seats and larger overhead baggage bins. According to the third issue of its EASA's Type Certificate, ATR 42-600 is ATR's marketing designation for the -500 series when fitted with the NAS (New Avionic Suite) or 'Glass Cockpit'. The ATR 42-600 designation is not recognised by EASA as a certified aircraft model or variant, and is not used on ATR certified/approved documentation; instead, only "Mod 5948", "ATR 42-500 with Mod 5948", "ATR 42-500 fitted with NAS", or ATR 42-500 "600 version" is used. Bulk (tube versions) and ULD freighter (large cargo door). An STC exists to convert all ATR-42 variants to all-cargo transport aircraft. FedEx, Aviavilsa, UPS, and DHL are major operators of the type. The ATR-42 "Surveyor" is a maritime patrol version of the −400. VIP transport and in-flight inspection versions of the −500 also exist. 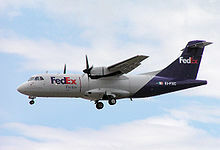 Besides those, FedEx Express operates 26 ATR 42s. Currently, Empire Airlines operates 4 examples of the ATR 42-500 for Hawaiian Airlines under the Ohana by Hawaiian brand. On August 1, 2017 Silver Airways placed orders for 20 ATR 42-600 aircraft, marking the entry of the -600 into the U.S. market. By November 2018, Loganair was to replace its Saab 340s and Saab 2000s, costly to operate and maintain, mostly the 2000, with around 20 ATR 42s over four to five years from the third quarter of 2019. As of December 2017, 5 ATR 42s were in military service. Polish Air Force leased one ATR 42-300 for six months in 2002. The ATR 42 has been involved in 46 aviation accidents and incidents including 33 hull losses. Those resulted in 276 fatalities. On 15 October 1987, an Aero Trasporti Italiani Flight 460 (ATI) ATR 42–300 crashed on Conca di Crezzo, Italy during flight from Milan-Linate to Cologne Bonn Airport, Germany. All 37 on board died. Icing conditions existed. On 21 August 1994, Royal Air Maroc Flight 630 crashed into the Atlas Mountains, killing all 44 people on board. It was claimed the pilot deliberately disengaged the autopilot and crashed the aircraft. On 31 October 1994, American Eagle Flight 4184 operated by Simmons Airlines, an ATR 72, crashed at high velocity into a soybean field in Roselawn Indiana, killing all 68 people on board. While in a holding pattern for Chicago O'Hare International Airport the pilots experienced a loss of control in icing conditions. The crash was the result of a sudden and unexpected aileron hinge moment reversal that occurred after a ridge of ice accreted beyond the deice boots. The National Transportation Safety Bureau (NTSB) findings however cited the manufacturer ATR, the French Directorate General for Civil Aviation (DGAC), and the Federal Aviation Administration (FAA) for their respective roles in the accident. On 30 July 1997, Air Littoral Flight 701, an ATR 42–500, overran runway 23 at Peretola Airport in Italy after a flight from Nice Côte d'Azur Airport in France. One of the crew was killed out of the 3 crew and 14 passengers. The aircraft was written off in the accident. On 11 October 1999, an Air Botswana captain boarded an ATR 42–320 aircraft at Gaborone Airport and took off. Once in the air, he asked by radio to speak to President Festus Mogae (who was outside the country at the time), Air Botswana's general manager and others. In spite of all attempts to persuade him to land and discuss his grievances, he stated he was going to crash into aircraft parked on the airport apron. After a flying time of about two hours, he performed two loops and then crashed at 200 knots (230 mph) into Air Botswana's two other ATR 42s parked on the apron. The captain was killed, but there were no other casualties. He had been grounded on medical reasons, refused reinstatement, and regrounded until February 2000. On 12 November 1999, Si Fly Flight 3275, an ATR 42-312 registration F-OHFV, was on a flight from Rome Ciampino Airport in Italy to Pristina International Airport Adem Jashari in Kosovo, operating on behalf of the UN. The aircraft crashed into a hill near Mitrovica in Serbia as it was making a turn to the left. The accident killed all 24 passengers and crew on board. On 11 October 2000, an ACES Colombia ATR 42-500 registered as VP-BOF was destroyed when it collided with a Boeing 727 of the same airline while taxiing at El Dorado International Airport in Bogotá, Colombia. There were no fatalities. On September 14, 2002, Total Linhas Aereas Flight 5561 an ATR 42-312 registration PT-MTS on a cargo flight between São Paulo-Guarulhos and Londrina crashed while en route near Paranapanema. The crew of two died. On 21 February 2008, Santa Barbara Airlines Flight 518 crashed in the Andes near Mérida, Venezuela, during a flight from Mérida to Simon Bolivar International Airport in Caracas. The aircraft was carrying 43 passengers and 3 crew. All died. May 8, 2008 – N904FX and N905FX, two parked ATR 42-320s, were written off after they suffered substantial damage at Piedmont Triad International Airport when the airport was hit by an EF2 tornado. On 27 January 2009, an Empire Airlines ATR 42 freighter under contract to FedEx Express crashed on landing at Lubbock Preston Smith International Airport at 04:37 CT. The aircraft, which had been traveling from Fort Worth Alliance Airport, landed short of the touchdown zone and skidded off the runway amid light freezing rain. There was a small fire and two crew members were taken to the hospital with minor injuries. On 11 February 2010, Trigana Air Service Flight 168 made a forced landing in a paddy field near Bone, Indonesia. Two people were seriously injured. On 13 September 2010, Conviasa Flight 2350 crashed 10 kilometres (6.2 mi) west of Manuel Carlos Piar Guayana Airport, Ciudad Guayana, Venezuela, on a domestic scheduled passenger flight from Del Caribe "Santiago Mariño" International Airport, Porlamar, Isla Margarita. Of 51 passengers and crew on board, 34 survived the accident while 17 died. On 9 June 2012, ATR 42 OK-KFM named "Benešov", operated by Czech Airlines, burned in a hangar at Prague Ruzyně Airport following an explosion. The machine was a total hull loss. On 19 October 2013, ATR 42-300 P2-PXY of Air Niugini suffered an engine fire on take-off from Madang Airport, Papua New Guinea. The take-off was rejected but the aircraft overran the runway and ended up in a creek. All three crew were injured and the aircraft was substantially damaged by the fire, which spread to the starboard wing. On 16 August 2015, ATR 42-300 PK-YRN Trigana Air Service Flight 267 from Jayapura's Sentani Airport to Oksibil lost contact with air traffic control over the mountains in Irian Jaya (West Papua). The aircraft's wreckage was found by villagers in the Bintang highlands region of Oksibil. Local residents reported that they saw the plane crash into the mountain side. Stormy weather was cited as a possible cause of the crash. All 54 passengers and crew on board the flight died, making this crash the deadliest involving an ATR 42. On 4 April 2016, a Batik Air Flight 7703 Boeing 737-800 was in the takeoff roll in Halim Perdanakusuma Airport, Jakarta, Indonesia when its left wing tip entangled with the vertical tail and left wing of a TransNusa ATR 42-600 crossing the runway under tow and separated the most of the vertical tail plane as well as the left wing from the ATR, with the left wing tank ruptured open. Both aircraft caught fire, and the Boeing was evacuated via slides. There were no injuries. However, both aircraft received substantial damage. On 7 December 2016, PIA Flight 661 ATR 42-500 with registration AP-BHO crashed in Havelian in Pakistan's Khyber Pakhtunkhwa province, killing all 47 on board. PIA Flight 661 was en route from the town of Chitral to Pakistani capital of Islamabad when it crashed into a mountain. On 13 December 2017, West Wind Aviation Flight 280, an ATR 42-320, carrying 22 passengers and three crew members crashed near the Fond-du-Lac, Saskatchewan, airport shortly after takeoff; no fatalities were reported at the scene,. but one of the injured victims died on 25 December. The carrier temporarily grounded its remaining ATR fleet. On 22 December, after identifying deficiencies in its Operational Control System, Transport Canada suspends the Air Operator Certificate of West Wind Aviation. ^ "ATR 42, ATR 72 Production list". 19 January 2017. ^ "Aircraft Profile: ATR 42-500". Airfinance Journal. 15 November 2012. ^ a b c d e f g h i j k l m n o "Company milestones." ATR, Retrieved: 29 July 2017. ^ a b c d e f g h i j "Milestones". ATR. 2006. Archived from the original on 17 October 2006. ^ a b c d e Sheppard, Ian. "ATR Creates Leasing, Asset Management & Freighter Unit." AIN Online, 7 June 2017. ^ a b "ATR ATR-42". Airliners.net. Retrieved 26 December 2014. ^ "First ATR 42-600 delivered to Precision Air Services". ATR. 9 November 2012. Retrieved 28 January 2013. ^ Thierry Dubois (21 February 2019). "ATR Is Developing A String Upgrades For Regional Turboprops". Aviation Week & Space Technology. ^ Bradley Perrett (9 April 2019). "ATR Working On Launch Orders For Short-Field 42-600". Aviation Week Network. ^ Gubisch, Michael. "PICTURE: Japan Air Commuter receives first ATR." Flight International, 20 January 2017. ^ a b "ATR 42-300/320" (PDF). ^ "ATR42 & 72 Type Certificate Data Sheet TCDS A.084, Issue 3." easa.europa.eu, 17 October 2012. p. 4. Retrieved: 2 April 2013. ^ "World Airliner Census". Flight Global. August 2017. ^ "Financial and Operating Statistics" (PDF). FedEx Corporation. 20 September 2016. ^ "Silver Airways signs LOI for up to 50 ATR-600 series turboprops". ^ "Loganair plans to revamp fleet". Shetland News. 29 November 2018. ^ Craig Hoyle (2016). "World Air Forces Directory 2017". FlightGlobal. ^ Davis, Anthony (19 December 2017). "MAF's newly inducted aircraft to boost service's COIN capabilities". IHS Jane's 360. Archived from the original on 24 December 2017. Retrieved 24 December 2017. ^ "Airscene: Military Affairs: Poland". Air International. Vol. 62 no. 6. June 2002. p. 323. ISSN 0306-5634. ^ "Aérospatiale/Aeritalia ATR-42". Flight Safety Foundation. 28 June 2018. ^ "ATR-42 Statistics". Flight Safety Foundation. 28 June 2018. ^ Harro Ranter (15 October 1987). "ASN Aircraft accident ATR-42-312 I-ATRH Conca di Crezzo". Retrieved 26 December 2014. ^ Harro Ranter (30 July 1997). "ASN Aircraft accident ATR-42-512 F-GPYE Florence-Peretola Airport (FLR)". aviation-safety.net. Retrieved 3 July 2015. ^ Harro Ranter (11 October 1999). "ASN Aircraft accident ATR-42-320 A2-ABB Gaborone-Sir Seretse Khama International Airport (GBE)". aviation-safety.net. Retrieved 3 July 2015. ^ Harro Ranter (12 November 1999). "ASN Aircraft accident ATR-42-312 F-OHFV Mitrovica". aviation-safety.net. Retrieved 3 July 2015. ^ "Accident description PT-MTS". Aviation Safety Network. Retrieved 23 July 2011. ^ Harro Ranter (21 February 2008). "ASN Aircraft accident ATR-42-300 YV1449 Mrida-A Carnevalli Airport (MRD)". Retrieved 26 December 2014. ^ "ASN Aircraft accident ATR 42-320 N904FX Greensboro/High Point-Piedmont Triad International Airport, NC (GSO)". Aviation-safety.net. Retrieved 15 April 2013. ^ "ASN Aircraft accident ATR 42-320 N905FX Greensboro/High Point-Piedmont Triad International Airport, NC (GSO)". Aviation-safety.net. Retrieved 15 April 2013. ^ "Plane crashes in eastern Venezuela". BBC News Online. 14 September 2010. Archived from the original on 14 September 2010. Retrieved 13 September 2010. ^ Hradecky, Simon (19 October 2013). "Accident: Niugini AT42 at Madang on Oct 19th 2013, overran runway on rejected takeoff". The Aviation herald. Retrieved 20 October 2013. ^ "Indonesia passenger plane wreckage found in remote Papua – BBC News". Retrieved 16 August 2015. ^ Hradecky, Simon (4 April 2016). "Accident: Batik B738 and Transnusa AT42 at Jakarta on Apr 4th 2016, collision on runway, both aircraft on fire". The Aviation Herald. ^ "PIA plane crashes near Abbottabad, all passengers feared dead". The News. Retrieved 7 December 2016. ^ "'No survivors' after plane carrying more than 40 people, including Pakistani pop star, crashes near Islamabad". news.com.au. 8 December 2016. Archived from the original on 8 December 2016. Retrieved 8 December 2016. ^ "PIA plane crashes near Abbottabad, all 47 people on board killed". Retrieved 8 December 2016. ^ "Plane carrying 25 people crashes near northern Saskatchewan airport". CBC News. 13 December 2017. ^ "Plane crashes in northern Saskatchewan with 25 people on board, no fatalities reported". Globe and Mail. 13 December 2017. ^ "C-GWEA accident description". Aviation Safety Network. Retrieved 27 December 2017. ^ David Kaminski-Morrow (18 December 2017). "West Wind grounds ATRs as Canadian crash probe begins". Flightglobal. ^ "Transport Canada suspends West Wind Aviation's Air Operator Certificate" (Press release). Transport Canada. 22 December 2017. ^ "family booklet" (PDF). ATR. September 2014. Taylor, Michael J. H. Brassey's World Aircraft & Systems Directory 1999/2000. London: Brassey's, 1999. ISBN 1-85753-245-7.